Dutch prime minister Mark Rutte has gone viral with a video showing him cleaning up a cup of coffee which he spilled while entering a government ministry. 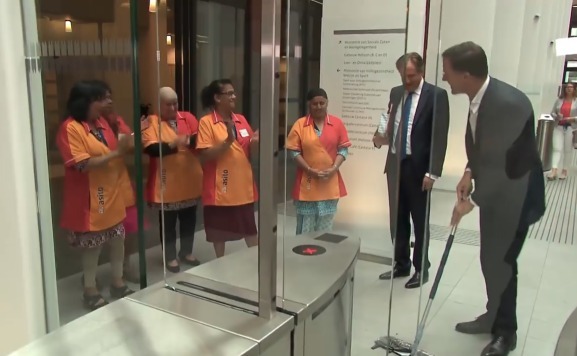 The footage, recorded by broadcaster NOS, shows the prime minister taking a mop from a cleaner, wiping up the mess and cleaning splashes off the security gate, to the cheers of the cleaning staff. The reactions around the world have ranged from disbelief that a prime minister would pick up a mop, to applause. The Washington Post said Rutte had become a ‘symbol of etiquette‘. Pakistan journalist Hamid Mir said he is ‘impressed by his humbleness’. That is why he is very popular in Dutch people, Mir said on Twitter. Others said Rutte had shown ‘true democracy, true leadership’. Closer to home, Emilie van Outeren, the NRC’s political correspondent in The Hague, notes that while the prime minister may have been being opportunistic, it is the reaction of the cleaners which is most surprising. ‘In which other country is there so little hierarchy that the cleaners would dare to react in such a way?’, she said on Twitter. The BBC, which placed the video online, said in coverage that politicians are often accused of making messes they don’t clear up. ‘But Dutch politician Mark Rutte decided to clean up parliament himself,’ the BBC added.